HDS-12 Carbon MFD, MFG# 000-13686-002, SolarMax 12" Multi-touch LCD, dual channel CHIRP Sonar, WiFi, internal GPS with Insight basemap. Optional Radar, AIS, Sat WX/Audio, NMEA2000. 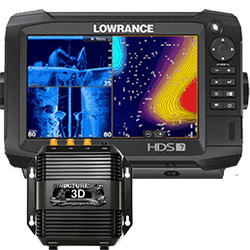 Includes StructureScan 3D module and two transom mount transducers.